BlockFi Reviews - Best Loan Options For You? For those who have at least $15,000 in Bitcoin or Ether, BlockFi is willing to give you a loan that’s 35% of your crypto balance. These loans come with a 12% interest rate, a 1% origination fee and a 12-month repayment period. 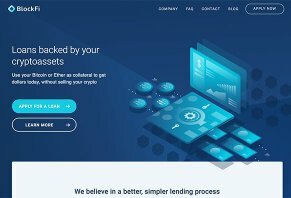 BlockFi is a lending company who provides loans to cryptocurrency investors who have Bitcoin or Ether balances of at least $15,000. These loans are backed by your cryptocurrency, which means that, in the event that you don’t repay your loan, BlockFi can recoup the loan value from your crypto. Exactly how a crypto-backed loan works is something we’ll talk about later in this review. For now, we’ll review a little bit about BlockFi’s history. The company is based in New York City and was founded in July 2017 and launched in August 2017 by Zac Prince and Flori Marquez. The duo has a background in debt and lending and decided to use their talents to create BlockFi. In an interview with HighYa, Prince talked about the motivation behind starting BlockFi. Is BlockFi a good choice for getting a loan? How does it work? Are there any drawbacks? These are the questions we’re going to answer in this review. We will walk you through how the loan works, what the criteria for an application are, what the rates and fees are and how BlockFi compares to other lenders. Then, we’ll wrap up with our thoughts on the company’s pros and cons, as well who we think this lender is good for. Let’s start off by pointing out that the loans BlockFi provides are what are known as secured loans. When a loan is secured, it means that the lender is giving you money and you’re giving them the rights to the property. For example, if you get a car loan to buy a vehicle, it’s considered a secure loan because the bank has the title to your car. If you don’t pay up, then the bank can repossess your car because, technically, they own it. Then, they can turn around and sell it and, presumably, gain back the money they gave to the dealership to pay for the car. Another good example of secured debt is a mortgage. If you default on your payments, the bank can foreclose on your home and sell it to recoup losses. This is why the bank owns the title to your home until you pay off your mortgage. BlockFi’s loans are secured because, when you’re approved for a loan, your cryptocurrency is moved into a secure wallet run by a company called Gemini. Your crypto is held in that wallet until your loan is paid off. So, much like a car or a home, if you default on your loan payments with BlockFi, they can “repossess” the equivalent amount of cryptocurrency it would take to pay off the rest of your loan. Now, the idea is that they’ll be discerning about who they lend money to so they don’t get into a situation in which a customer fails to pay them back. To ensure that, they have certain requirements for who can get a loan. We’ll talk about those in the next section. If you’re interested in getting a loan with BlockFi, you’ll have to meet certain requirements in order to do business with them. Now, the application process will ask you for more than just your bankruptcy or lien history. They’ll want to know your address, social security number and other information just like any lender. In the end, though, Pricne said those three bullet points we mentioned are the most important factors. If you meet all three, there’s a good chance you’ll be approved. If you fail at any one of them, there’s a good chance they’ll deny you. Up to this point, everything about BlockFi’s loans is pretty straightforward. The terms of the loan add a few extra details but, in our opinion, still maintain a level of clarity that most borrowers can understand. When you’re approved for a loan, your loan amount will be 35% of the crypto assets required for collateral. If you have $15,000 of Bitcoin or Ether, then the max loan amount be $5,250. Your interest rate will be 12% and your loan term will be 12 months. BlockFi charges an origination fee of 1%. You’ll make interest-only payments for the first 11 months and, in the 12th month, your entire principal amount will be due. So, for a loan of $5,250, you’ll pay $630 in interest and $52.50 origination fee. You’ll need to transfer $15,000 in Bitcoin or Ether, then make monthly payments of around $57 (interest and origination fee). When the final month of your loan rolls around, your principal amount of $5,250 will be due. Meanwhile, BlockFi will hold $15,000 worth of crypto in the secure digital wallet provided by Gemini. Once the loan is paid off, you get your crypto back. Pro tip: You can use cash or crypto to make your monthly interest-only payments. Also, keep in mind that what you pay in capital gains taxes depends on multiple criteria. Why Would Someone Want to Get a BlockFi Loan? The government levies capital gains taxes on the cryptocurrency you sell. It’s kind of like how investors have to pay taxes on the money they earn from their stocks. Now, let’s say your wife wants to renovate your kitchen because she just found out that you bought Bitcoin low and now it’s far more valuable (this was a real scenario Prince told us about). You don’t like the fact that you’d have to pay taxes on your crypto withdrawals, so you turn to a company like BlockFi, who will give you a loan based on the value of your Bitcoin or Ether. It’s very similar to a home equity loan, in which you’d take out a loan based on how much value you have in the home after you subtract what you owe on your mortgage. This value, as it is with your crypto, is theoretical in the sense that you aren’t giving the lender your home or your crypto. The lender, however, is willing to lend you the money because they know you’ve got enough equity to where, if you didn’t pay up, they could tap into that equity to cover their losses. So, as Prince pointed out to us, a BlockFi loan is a great way to get around the taxes you’d pay if you cashed out your crypto and used it for that kitchen renovation. Are BlockFi Loans Cheaper Than Capital Gains Taxes? The real question, of course, is how much money BlockFi would save you over cashing out your crypto for, say, a $15,000 kitchen renovation. To figure that out, we used a capital gains tax calculator from Smart Asset to find out your tax liability on a $15,000 cash-out on Bitcoin you bought at $500 a few years ago. Your income is $150,000 (BlockFi clients are, typically, high earners) and your filing status is single. You live in New York. According to the calculator, you’ll have to pay $3,668 in capital gains taxes to withdraw that money and get a new kitchen. Based on BlockFi’s fee structure, you’ll pay $1,950 in interest and origination fee. Some states will assess capital gains taxes as well as federal taxes, which explains why the taxes you’d pay vary between states. In addition to paying lower fees, BlockFi offers another possible benefit. If your crypto value goes up during the year you repay your loan, you still own what’s being used as collateral and the value of those holdings go up. However, if you sold the crypto to pay for your new kitchen, you don’t get any of those gains; the crypto’s already gone. Based on our research, we believe BlockFi’s greatest strength is that, for high earners who bought Bitcoin or Ether low, the company’s lending fees will most likely be cheaper than the capital gains taxes you’d pay. The downside of using BlockFi is that consumers who don’t have at least $15,000 in Bitcoin, Ether or both can’t use the site. If they want to remodel their kitchen – or at least get new appliances – they’d have to cash out their holdings and pay capital gains taxes. We believe this lender is best suited for those who have at least $15,000 in crypto and who live in states that charge capital gains taxes. We also think it’s a good option for those who don’t want to sell off their crypto in order to make a big purchase. Write a Review for BlockFi!